We value our customers’ happiness and make every effort to provide superior service and products. When you receive your Third Shot Drop order, if you don’t like the look of it, send it back for a full refund*. We will happily refund the purchase price of your ordered merchandise within 30 days of purchase*. We accept all paddles and products in original, unused, unaltered condition complete with all components included in original order. Simply contact us to obtain a return authorization number. Customer is responsible for return shipping costs. Upon receipt, we will confirm return is within stated parameters and promptly issue a full refund for the cost of the merchandise. We believe our paddles are the best you can buy. Our crew works hard to make every paddle from the best materials, constructed with absolute attention to detail. Lifetime warranty against manufacturer defects and workmanship and a 1 year no dead spot guarantee. Then there’s reality. We know you can get really excited in the heat of a great game, but if you destroy your paddle in the process, there’s a limit to how much we can do to save it. All paddles must be registered (click here to go to registration form) upon receipt to activate the warranty. It only covers paddles shipped directly from the factory to registered purchaser. Paddles that have been resold, used for demonstration purposes, are discontinued or clearance models are not covered by this warranty. Warranty coverage does not include damage from normal wear and tear, abuse, fading, or resulting from contact with anything other than an approved pickleball (i.e. net, ground, another paddle). Aluminum core can behave very differently from the other cores, so aluminum core paddles are covered on a per paddle basis. To make a claim for a damaged aluminum core, the paddle must be submitted for review to ascertain culpability. BUT, before you toss your battle-worn paddle, send us an email. Depending on what’s been done, we may be able to offer help in the form of recommendations or repairs. You might be surprised to learn your paddle still has life in it! 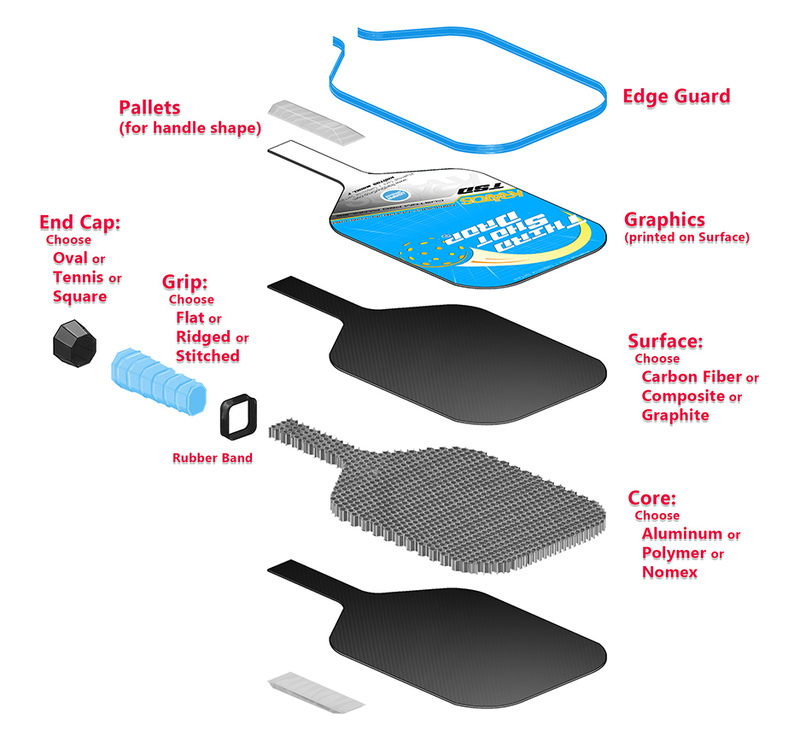 *Paddles ordered with custom graphics are non-refundable.